Imogene is forced to move back home to New Jersey, because her boyfriend broke up and her career has went down the drain. Now she is forced to live with her eccentric mother and her strange lover, her shy and awkward brother, and the guy who rented her old room. The world she gladly ran away from is back in her life, and there is no turning back this time. Girl Most Likely tells the story of a woman who ran off to the big city in order to grow up, but when she is forced to move back home she has to realize that nothing has changed and she feels like a helpless teenager again. When I think of Kristen Wiig, I immediately think of her hilarious performance in Brides Maids. In Girl Most Likely she keeps her awkward charm that we love so much, and adds plenty of second hand embarrassment moments to it, however, the story is so boring and insignificant sometimes, it is hard for her to keep the pace up. Annette Bening does a wonderful job, too, and plays a character comparable to the one in Running With Scissors, but with the flat script it is hard for her to shine as well. There are many other great actors in this movie but none of them can really help turning the story into something special. I didn’t have high hopes for this movie, and I only watched it because I like Kristen Wiig, and honestly, she is probably the only reason why it isn’t a complete snooze fest. It almost seems like the writers couldn’t decide whether they want the movie to be a drama or comedy. Kristen Wiig could do both, I am sure of that, but I would have rather seen her in a straight forward comedy. 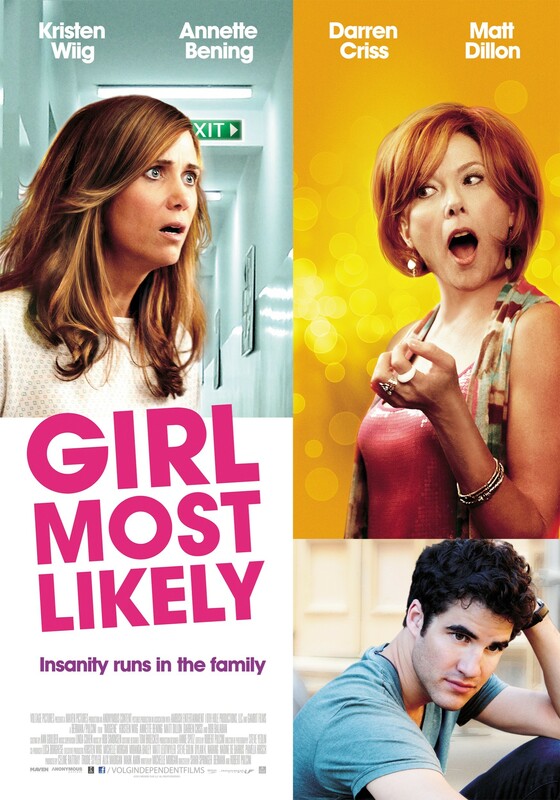 Girl Most Likely not a complete waste of time, but it’s not a movie I would watch a second time. Yes, indeed! 😀 Thanks for commenting! Words cannot describe how much I love Kristen ‘Bridesmaids’ Wiig.. So I totally love this post..
Good review Simon. Probably my least favorite of the year for many reasons, but the main which is that it just wastes every talent this flick has to offer. Even Matt Dillon. Even he.